I know I’m a little late to the game posting about the new LURVIG cat furniture collection from IKEA, but I wanted to go see it for myself before commenting, and I’m glad I did because OMG IT’S INCREDIBLE! I adore everything IKEA does. An IKEA store is pretty much my idea of heaven and I’m constantly in awe of their ingenious designs at affordable prices. So, I was very excited to hear that they had expanded their pet offerings with this new collection, which includes products for both dogs and cats. When we got to our local IKEA store in Tempe, AZ, the pet section looked like a bomb had exploded, it had been ravaged by enthusiastic pet owners clamoring to get their hands on the goods. Once I started examining each cat item, I started to see the signature IKEA good design behind this line. Aesthetically, the products are standard IKEA fare – clean lines, basic colors (primarily black, white and bright green for the pet goods) and they resemble most other IKEA products, but when you look more closely at the functionality and modularity of the line, it is quite impressive. Several of the pieces work together, plus some coordinate with other non-pet IKEA items. There are a few products that are truly multi-functional and all are extremely affordable. Overall this is a big win for IKEA in my opinion. Here’s a look at each of the cat items in the new LURVIG collection. The folding fabric Cat House is similar to the DRONA storage box but this one has a circular opening in one panel, creating a hideaway for cats. You can add a soft cushion that fits perfectly inside, but best of all, this cube fits in the KALLAX shelf unit, one of my favorite things to use in Catification projects. The idea of modifying an existing product (DRONA) for cat use and then pairing it with another popular product (KALLAX) is brilliant. And this product addresses a cat’s desire to cocoon while allowing you to choose the location and integrate it into your decor. Serious, it really doesn’t get much better than this. But wait, yes it does! There’s another freestanding cat bed/house made from fabric covered foam. This one fits the same optional inner cushion as the other cat house (nice modularity!) plus it converts into three different uses. You can use it as an enclosed hideaway with a side opening, a soft bed with a high back and sloped sides or a comfy bed with low sides, all by simply folding it over on itself. What?!?! Nicely done. And I love the mod black & white star/flower pattern on the inside that shows up on several other products as well. This pet bed uses standard IKEA construction to create a box-like lounge with a cushion. It comes in two sizes and both can be used right side up to create a bed with sides and a back or flipped over as more of a step or a bench. You could use this to help senior pets reach the sofa or the bed. So simple but so functional. This folding pet bed is kind of like a mini version of the SOLSTA Sleeper Sofa, again adapting a successful human product for pet use. This one made me giddy! It’s another cat house made with standard solid IKEA construction, it has a hideaway inside, a perch on top and a sisal scratcher on the front. The same cushion that fits inside the first two cat houses fits in this one, too. Here’s the fun part — you can use it with the legs to create a freestanding raised hideaway, you can mount it to the wall, or it fits inside the KALLAX shelf unit. BRILLIANT! IKEA has a few different products that are essentially folding tubes — a laundry basket and a hanging storage container — so it makes sense that they would add a cat tunnel to the LURVIG collection. 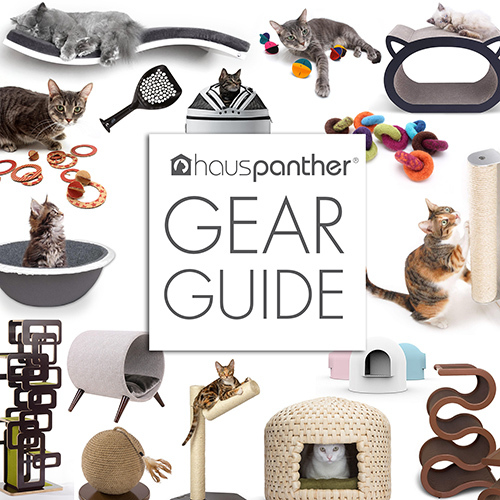 This one goes a step further and attaches to the folding fabric cat house that fits in the KALLAX shelf, letting you create a whole playground for your cat. This sisal scratching mat is a simple solution that works beautifully. It wraps around any table leg and is held in place with three strips of Velcro. I bought one of these and the cats love it. It is quite sturdy and stays in place perfectly. Because it attaches to a table leg, it creates a scratching surface that lets cats really dig in. There’s also a roomy pet carrier that collapses for easy storage. The LURVIG collection includes several feeding dishes and mats as well as a water dispenser, starting at just $.79! This pet blanket, along with the other cushions in the mod flower/star print, are all made with water-resistant fabric, which also repels fur quite well. Of course, there’s a sleek plastic litter box that’s average size. This one has curved corners inside making it easy to scoop. And speaking of scoops, the coordinating litter scoop hooks onto the side of the box, something that makes me very happy. And finally, this pet bed is actually just a cover (made from the water-resistant fabric) that you fill with your old clothes, giving the bed your scent, something that is comforting to a cat. And if the litter box above is a little too small for your cat to use for that purpose, the smaller pet bed cover fits perfectly in the litter box creating a stylish bed. I was at IKEA just yesterday and spent some time in the pet area. They have really come up with some great designs – intuitive and creative. I was impressed. About every 8 years I replace my cat boxes and really like the IKEA design. Regarding the metal food bowls, the smaller bowl is a more ideal design (wider, than deep) for cat food as my boys don’t like deep dishes. Thanks for highlighting the cat products from IKEA. I must admit to getting overwhelmed by the big stores, the catalog rarely has whole collections, the web site can be erratic when looking for one piece to fit in another collection. So I appreciate your blog making IKEA simple for me! I am checking out the spaces I can use some of these items now! I know, they are wonderful pieces of cat furniture. I can’t wait to try some of them. This is all great and can’t wait to get my hands on some if this gear but living in the U K when will I be able to buy it? Very disappointing—went to the website link only to find that the products are NOT carried at the IKEA store in my city and they are not available online. Total bust! I went today and got two LURVIG cat tunnels for my cat and my friend’s cat for Christmas. WOO HOO! Thanks for the article, I would have never thought to go to IKEA for cat furniture and toys. I got two of the black folding cat beds, my cats absolutely love them. I plan to go back for a couple of the tunnels.